I bought this Karl Lagerfeld shirt back in the spring and for a while I wore it a lot. It was so comfortable and easy for work but still looked really put together. Over the summer though, I never wore it. I do that sometimes. I completely stop wearing something for a bit. I think its so that when I do start wearing it again, it feels like its new. Which is exactly how it feels today. The shirt has sheer panels down the front and then the back is completely sheer. It work I used to wear a white or black cami underneath to make it more work appropriate. Going out I usually wear a bandeau or something interesting underneath that can be seen through the sheer panels. I wore it with a white bandeau, my leather pants and boots today (monochrome as usual!). I’ve been pretty bad at accessorising lately, I either forget to put stuff on or I’m just too lazy. 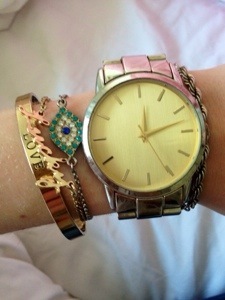 Today I have a bit of arm candy with my Asos watch and then an assortment of bracelets.